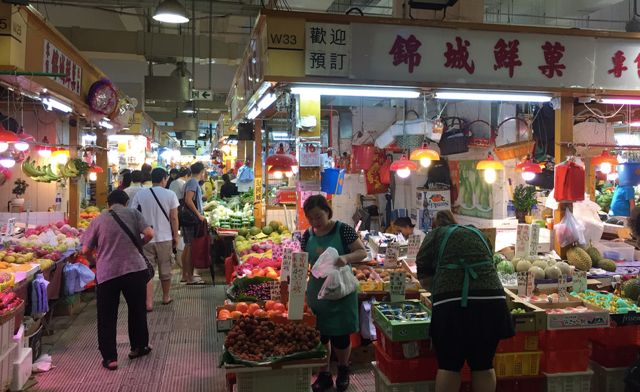 Tai Po, a market town in the Hong Kong Northern Territories, gave us a brilliant, true Honkenese experience. Being in Tai Po is very different from Hong Kong Island and Discovery Bay, and not on the typical tourist trail. In fact, we didn’t spot any tourists at all. It has a far more Chinese feel to it. It reminded me of the smaller towns we visited in China a few years ago. Now, when I say “small town”, remember I mean small for China or Asia. 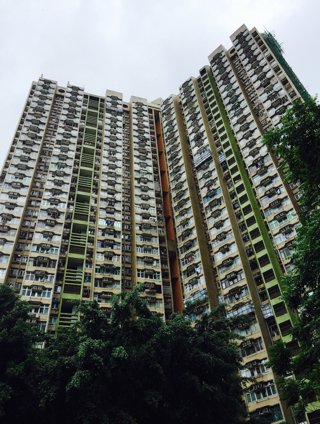 Tai Po’s population is around 320,000! But you do get a smaller town feel whilst mooching through the town streets and markets. 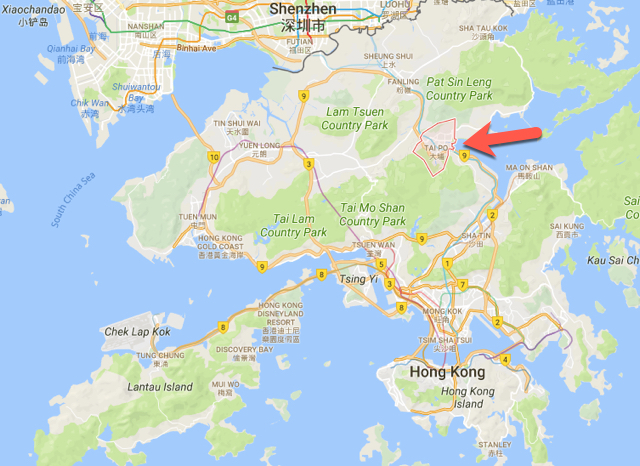 As you can see from the map below, it sits on the North Eastern side of Hong Kong, well away from Kowloon or Hong Kong Island. It takes about 60-90 minutes to travel there, depending on the method of transport. It was a little difficult to do our sightseeing when it chucked it down every 10 minutes. Umbrella up, umbrella down, umbrella up, etc. But, Hong Kong is pretty well organised for rain … and sun actually. So many point-to-point paths are covered, providing cover when it’s raining and shade when the sun is out. In spite of the weather challenge, our highlight was the Tai Po Wet Market. 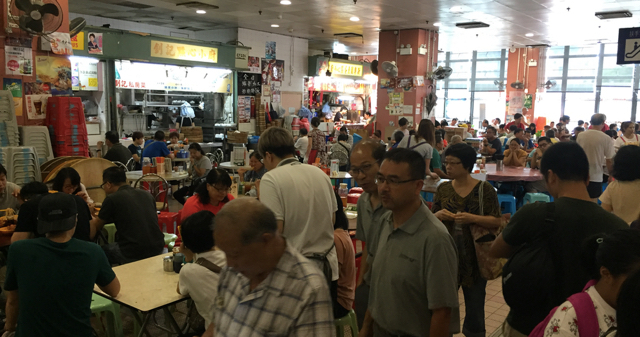 In fact the sign reads “Tai Po Hui Market and Cooked Food Centre“. It took us by surprise, as we weren’t expecting it to be a modern looking, multi-storey building. We came in on the side of the lifts, as we were escaping the rain, but the queues were very long. A sign said ‘cooked food market – floor 2’, so we headed up the stairs. As we arrived on the second floor, this scene greeted us. It was heaving! There are so many stalls, all the tables were full and none the signs were in English. Perhaps if we were braver, we could have discarded our lunch plans and eaten here! But we decided to stick to our plans (another story for another day), and just do a circuit to check out what people were cooking and eating. I think it is fair to say that the food looked like, what I would term as ‘typical Chinese’ food. Go a floor down, and you arrive in the fruit and vegetable section. This is the first market we’ve found where most produce displayed no prices. I guess this means you’re expected to barter. Unfortunately we didn’t need any fruit or veg, so we didn’t buy anything, except for a few mangosteens, which I love! But there were a few things I am keen to try. Next time! On the ground floor, there is the true wet market: fish and meat. But call me a whimp … but I struggle not to get freaked out by innards, offal and unidentified creatures destined for dinner. I prefer my protein to be packaged. Wrong I know – perhaps Asia will cure me of this ailment, only time will tell. The first time we walked up Fu Shin Street, we were so busy looking at all the produce and wares, we completely missed the temple. How do you miss a temple? We checked the map, and turned around, retraced our steps. And yes, it is possible to miss the temple, because it is really quite small and set back from the street. Not helped by the fact that we had been scrambling for our umbrellas when we walked past it the first time. In a way, the rain added a certain amount of charm. 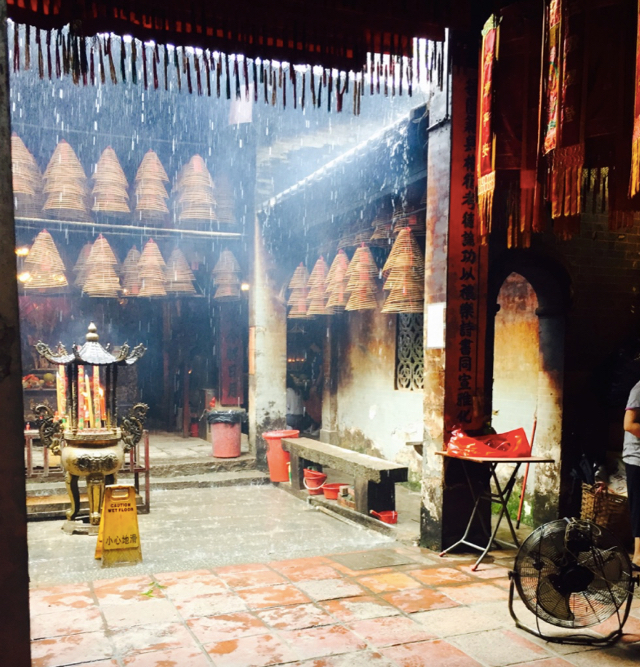 When you walk in the front door, there is a little courtyard in front of you where incense is burned, but that section has no roof, so the rain pours in. (You can see this clearly on the first photo right at the top of the page). We couldn’t really move around much as they had some workmen in, which meant walking through the rain! But it didn’t seem like there isn’t too much more to it. 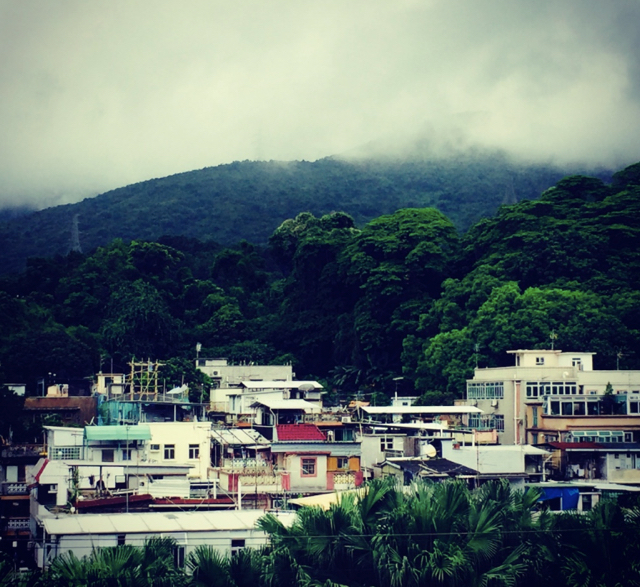 Where do people live in Tai Po? Tai Po does have a mix of old and new. This high-rise building is typical of the ones in the area. But step out onto the patio at the wet market, peer over the wall, and you can see some of older, traditional low rise buildings. It was a little too wet to explore much more last time, but now we’re going back, we hope it will be drier! Comparing these two: the old and the new, look worlds apart! When ever you visit a place, you often think: next time I shall do this. But the reality is, there usually isn’t a next time, because there are just so many things to see. But for us, there is a next time. Today we will be meeting up with Andrew and Jackie who moved back to Hong Kong a few years ago. Only once we’d left Tai Po, did we find out they live so close by. So we have now made firm plans to meet up with them for a good catch up, natter and for us to bombard them with questions which will require their local knowledge! Looking forward to it. Hope you’ll follow us over the next few months as we travel through Asia. 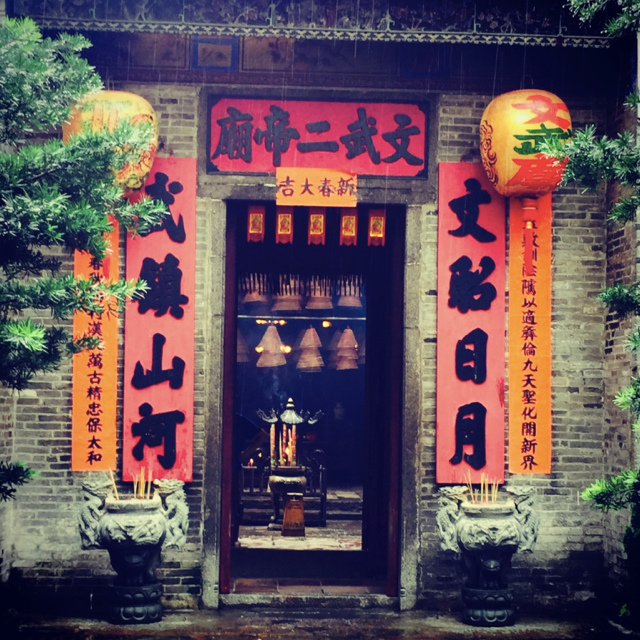 See what we’re planning and where we will be going as we travel through Asia ….